The trail may not be usable during flood stage and may be muddy for several days after rain. The walk starts on the north side of the boat ramp at the end of Potomac Hills Street near the visitor center. 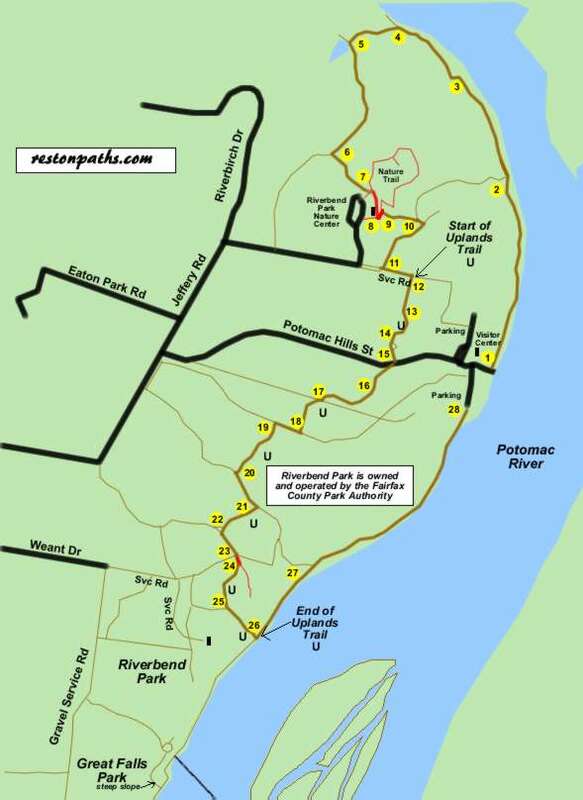 The wooded trail will be found entering the grassy area near the river. Walk north with the river on your right. The trail intersects with a path to the left marked with a Nature Center sign. Continue straight on the present path along the river. The trail turns left and then right to cross a bridge. Continue straight on the trail after crossing the bridge. At the next trail split turn left to follow the wide trail away from the river. The trail approaches a pond. Place your mouse over the picture to view the change in the pond from March until August. Take the trail on the left side of the pond up the hill. Turn left at the next trail intersection marked by a sign indicating no bicycles or horses. The trail crosses a boardwalk for a short distance. The trail intersects with an asphalt path. Turn right onto the asphalt path. The trail reaches the front of the nature center. Turn left to follow the sidewalk extending from the doorway. Turn left onto the asphalt path next to the outdoor display where the sidewalk curves to the right. Turn right onto the first intersecting trail. Several wooden steps mark it. After a short distance turn right onto the next trail. It goes for a short distance into a meadow. Turn right again where it intersects with the remains of an old dirt driveway and follow the driveway. The driveway intersects with a service road. Turn left onto the service road going down the hill. Turn right onto the path marked by the large Uplands Trail sign. This is the start of the Uplands Trail. There should be markers at all intersecting trails indicating all turns that should be taken while on this trail. The trail passes a display case in the field. Continue to the right of the display case. In the woods a sign indicates that horses should turn left. Continue straight unless you are riding a horse. The paths rejoin down the hill. The trail crosses the entrance road to the park. The trail crosses a short bridge at the bottom of a hill and climbs the hill. At the next trail intersection turn right. After a few feet turn left to continue in the original direction. Markers for the Upland Trail indicate both turns. Turn right at the next trail intersection. After a short distance turn left onto the intersecting trail. After the trail crosses a bridge turn left onto the intersecting trail. Turn right at the next trail marker. The trail goes up a hill and logs are placed across it as shown in the picture. The trail ends at an intersecting trail and marker. Turn left. The trail intersects with a service road with many signs. Cross the service road onto the remains of an asphalt driveway. After a few feet turn right at the marker for the natural surface trail. Turn left at the next trail marker. Follow the trail next to a small gully down the hill. The trail reaches the river. This is the end of the Uplands Trail and the markers. Turn left to follow the trail along the river going upstream. The trail enters a grassy meadow with a display case on the left. Continue along the trail next to the river. The trail enters the parking area completing the walk.